Alaska’s recreational marijuana business owners are fighting for the right to outfit their shops with a separate space to accommodate full consumption, including smoking, on their premises. The move is largely designed so they can offer the 1 million-plus tourists who visit the state every year a place to consume cannabis. After months of rec business owners quibbling with the state’s Marijuana Control Board during public comment sessions over how onsite consumption should look, the panel finally voted to start drafting the regulations. If those rules are finalized, the Last Frontier would become the first market in the nation to allow onsite consumption of cannabis. Public consumption has been a hot issue since the recreational law went into effect in 2015, part of a greater trend toward social-use permits in the United States. Denver has been working on citywide social regulations. Maine has a social-use provision in its developing recreational law. And Nevada is expected to allow cannabis clubs once its full recreational laws are written. Greg Allison – a former director of tourism for Explore Fairbanks, the area’s destination marketing organization – is well-qualified to speak to the need for onsite consumption in Alaska. Allison hopes to be among the rec cannabis owners who improve the Alaska experience for travelers. He’s co-owner and operations director for Good, a prospective fully integrated marijuana business in Fairbanks with pending license applications after the buildout and inspection process is completed. 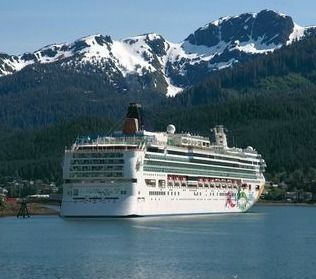 It happens most days in the summer: A cruise ship docks in southeastern Alaska and thousands of visitors step ashore. Often the towns where the passengers disembark have fewer people than the boat’s carrying. Some of these visitors pop into a retail marijuana shop fresh off the boat and buy product. Public consumption is outlawed, thus preventing the tourists from taking the marijuana back on the boat. So they break the law and smoke it on the street or in a public park. “Everybody wants to come up and try some marijuana in Alaska,” said Cary Carrigan, executive director of the Alaska Marijuana Industry Association. Carrigan said the pushback he’s hearing is that people on the cruise are elderly and aren’t interested in buying marijuana. That’s stupid, he said. “The lady who is getting off the cruise ship – who has blue hair and a walker – is the blonde who was dancing in the mud at Woodstock and wants to fire one up,” he added. Allison said tourists accounted for about 50% of marijuana sales in the summer in the Anchorage region, and in the Fairbanks area, a high percentage were also travelers. Keenan Hollister – co-owner of Pakalolo Supply Co., a vertically integrated cannabis business in Fairbanks that was the first in the state to sell recreational marijuana – pointed out that onsite consumption will benefit more than tourists; it’s also for Alaska residents. He explained that the intention of Alaska’s rec legalization was to regulate marijuana like alcohol, but so far, cannabis is sold only in stores, not consumed in public places. “We want it to be just like bars are for alcohol,” he added. Hollister has the space to convert his packaging facility into a stand-alone consumption area right now. The close, 3-2 vote to draft the regulations illustrates how divided the marijuana board has been over onsite consumption. The proposed regulations range from where and how much marijuana can be consumed on premises to restrictions on ventilation. Whether to allow smoking has been a major sticking point. In fact, Carrigan said his association has been fighting with the American Lung Association’s attempt to ban all smoking. And though Allison is a proponent of onsite consumption, he’s among those concerned about the proposal that businesses create a stand-alone space. Undergo the regulatory process again. Add security for that space. Create a nonsmoking area for retail employees. That would hurt “a majority of us in a big way,” Allison said, in terms of added costs for businesses. Leif Abel – co-owner of Greatland Ganja in Kasilof – worries that too much tinkering with the proposed rules will lead to another round of drafting and public comment. One major city’s governing body, the Anchorage Municipal Assembly, recently filed a formal request for the marijuana board to finalize the rules. Abel’s interpretation of the ballot measure passed in 2014 was that onsite consumption should have been allowed when the law went into effect. “The people should get what they want,” he said. To Abel, onsite consumption is an important component if recreational marijuana is to be fully integrated into a community.